Natcore Technology aims to replace the traditional thermal vacuum processes, such as CVD and PECVD (chemical vapor deposition, plasma enhanced chemical vapor deposition, etc.) for making solar cells with their liquid phase deposition (LPD) wet chemistry process. They don’t produce solar cells, but controls technology that promises to make solar energy cost-competitive with energy derived from fossil fuels. They have joint research agreements with Rice University, the National Renewable Energy Laboratory, and the University of Virginia. Natcore Technology thinks LPD is the future of solar. It is at the core of everything we do. 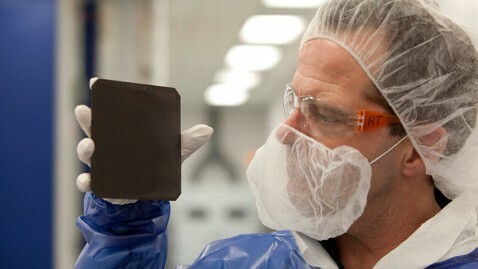 It results in solar cells of higher quality, and is safer, cleaner and less expensive than CVD. That’s why they are using multiple LPD-based applications to make solar power cost-competitive with conventional power. This could change our perception towards manufacturing of solar cells in future. Working in their Rochester R&D Center, Natcore scientists have built an all-back-contact silicon heterojunction cell structure in which silver has been completely eliminated. It has been replaced by aluminum. This substitution has been accomplished with no loss of performance. When Natcore Technology Inc. announced the development of a breakthrough solar cell structure on July 9, they indicated that the new low-cost configuration might allow for the elimination of silver from mass-produced solar cells. When sunlight hits a silicon cell, it generates electrons. Ever since practical solar cells have been made – about 60 years ago – silver has been used as a conductor to collect these electrons in order to form a useful electric current. Silver was originally chosen for this role because it is a high-conductivity metal. The average solar panel uses about one-half of an ounce of silver. SNNLive - Natcore Technology Inc.
Silver represents >48% of the metallization cost of a solar cell, or about 11% of the total raw material cost of a solar module. The cost saving realized by switching from silver to aluminum are important. That’s because silver, while highly conductive, is also high-cost. At today’s prices, silver costs about $15.28 per troy ounce. The same quantity of aluminum costs $0.05, about 0.3% of the cost of silver. Even considering that it would be necessary to use twice as much aluminum as silver in order to have an equal amount of conductivity from cell to cell, the raw material cost of aluminum would still be just 0.6% of the direct material cost of using silver in the cell. Natcore’s novel design allows for aluminum to be easily substituted for silver. Natcore scientists used their proprietary laser technology to apply contacts to the rear of the cell as well as for other critical aspects of the process.